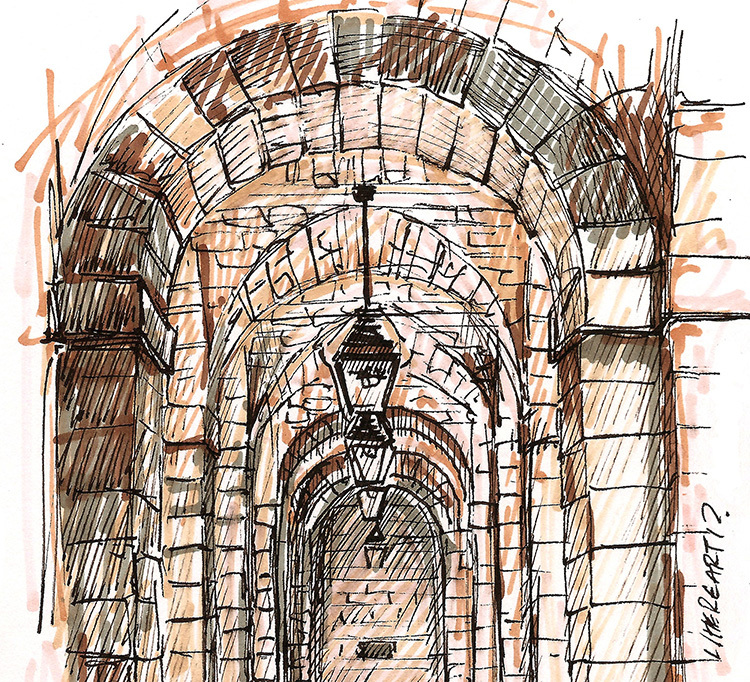 Where in Edinburgh have I sketched? If you can you tell me where in the Scottish capital I have sketched then you could win a great prize. Email me your answer using the link below and I will randomly pick a correct answer tomorrow morning, who will then go into the monthly draw to win a prize. The prize for February will be confirmed later today. The answer is always in Edinburgh so keep looking up and noticing the details in Scotland’s stunning capital city. Keep an eye on my facebook and twitter feeds for clues through the day if they are needed. Enter via the link above or email contact@edinburghsketcher.com with the subject line ‘WhereArtI 12th February 2018’. WhereArtI update 12th February. These arches reach over the Great War Stone at the Edinburgh City Chambers building on the Royal Mile. Joan Ballantyne goes into the February draw to win a meal for two at the Grassmarket Apex hotel.